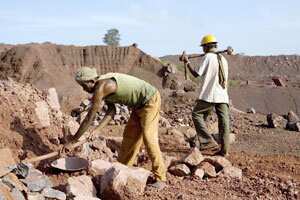 Panaji: In the backdrop of a slump in demand for the iron ore in his country, a senior Chinese embassy official on Thursday underlined the need to establish long term trade agreements and a new pricing system with India for maintaining demand and supply equilibrium. Gang was speaking at the international conference on Iron Ore and steel Making Raw Materials’ here. Observing that it is imperative to maintain a transparent and stable policy system of mining, trading and export, he said, “both sides might try to establish a long-term iron ore trade agreement with a new pricing system, with the purpose of establishing a long and stable supply and demand relationship". The two-day conference has attracted several Iron ore traders and buyers from across the globe, including from countries like China and Indonesia. Stressing the need for a better cooperation between the conventional trading partners, Gang said, “China and India might carry out a comprehensive cooperation on environmental protection and low-carbon economy, try to apply green innovative technologies to produce green and clean steel and other products". “India and China should continue to deepen mutual trust, strengthen communication, promote mutually beneficial cooperation, properly handle differences, so as to enhance the development of China-India strategic cooperative partnership and create a favourable macro environment for the iron ore trade between the two countries," Gang said. Pointing out that the two neighbours can enhance cooperation in the areas of mining exploration and processing, he said, “new policies should be adopted to encourage FDI in this sector". “From our side, we would like to encourage more Chinese enterprises to establish additional joint ventures in iron ore and steel-making sector with their Indian peers to increase the capability of iron processing and steel production of India," Gang said. During the past 3 years, mutual investments have boosted 10 times, and Chinese enterprises have completed infrastructural projects with total value of more than $10 billion in India, he added. “The bilateral trade volume reached $61.7 billion in 2010 (which is) 20 times increase in ten years. From January to September of this year, bilateral trade maintains a strong momentum of growth, while the two-way trade volume rose by 20% to $54.5 billion against the year-ago period," Gang said.